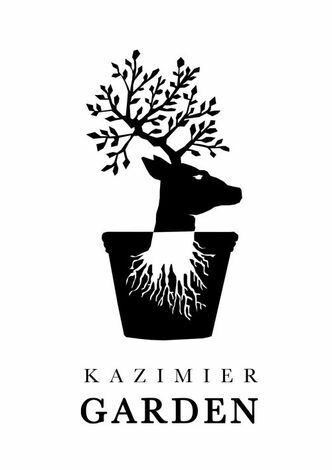 A whirlwind smashes through the Kazimier Garden and Getintothis‘ Adam Forster gets caught up in a Shangaan swirl. It’s like mental fast techno meets traditional African dance music came the reply to the question what is Nozinja?, and they’re signed to Warp. 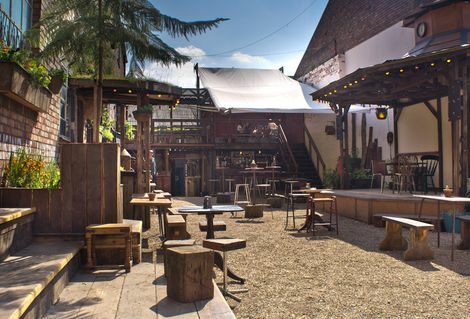 The venue was to be The Kazimier Garden(a host to Nozinja’s theatrics for the second time after Sound City 2014, covered back in May) and it still wasn’t entirely clear how the cool, low-lit bar/grill does function perfectly as the back-drop for a frenzied tribal mash-up. 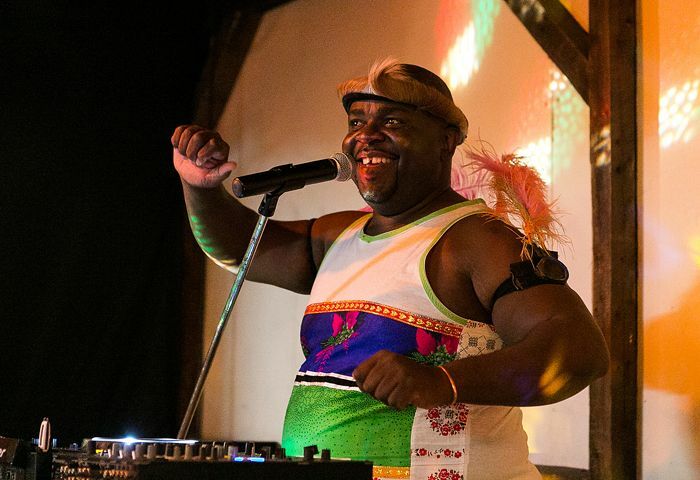 In fact, the term coined for the new genre is “Shangaan Electro”; ‘Shangaan’ the name for a member of the Tsonga people spread throughout Southern Africa, and the full term a heady amalgam of Tsonga disco, Kwaito house, and a multitude of underground dance styles currently thriving in the Limpopo region of South Africa. 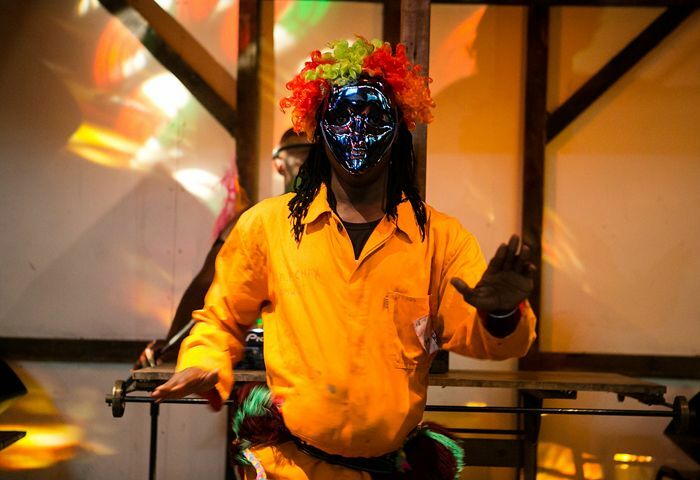 Former mobile phone shop repairman Nozinja is undoubtedly spearheading the movement, which looks dead set to increase its influence on the modern ‘rave’ scene. After two 12’’ releases for Dan Snaith’s Jiaolong Records under the alias Xitsonga Dance, Nozinja was featured on a compilation released by Honest Jon records and shortly afterwards found himself being signed to Warp Records. 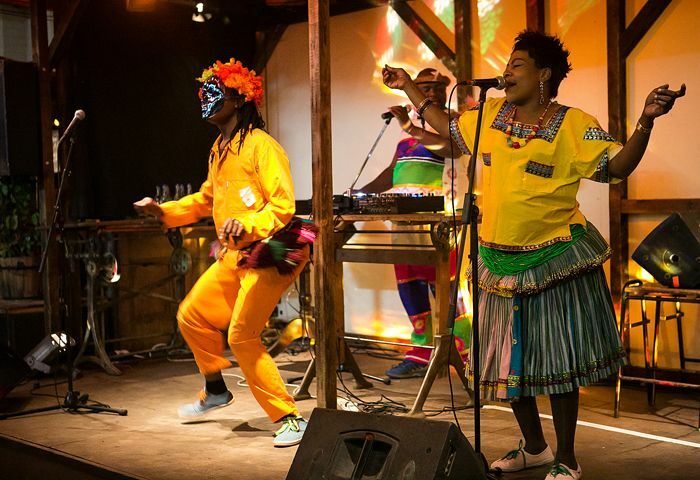 Having only released one single on Warp thus far titled Tsekeleke, Nozinja have managed to create a video as colourfully energetic as their sound. 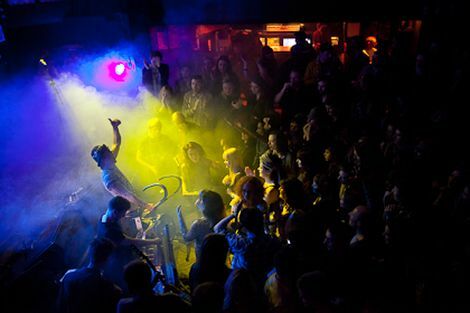 With kaleidoscopic expectation in mind, the crowd quietly amped themselves up to meet the requisite level of sprightliness as three brightly dressed folks walked onto the stage, cut the house DJ set off to a sudden silence, and lifted the fader on the first track. With no introduction, a man dressed in a bright orange jumpsuit (padded at the buttocks and stomach) and wearing a sparkling mask, burst into the most incredible energetic, jangling trance-like dancing – to what was soon made clear would be amongst one of the slower tracks this evening. Nojinza pumped out beats in an endless loop of 4/4 thuds, whilst chopped-up staccato synth pads and traditional African drum samples formed hypnotic, weaving melody lines. 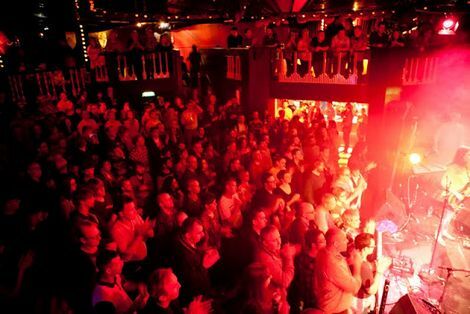 To the right of the stage stood a woman in a multi-coloured dress who took to alternating between a soulful lead vocal performance and playing the female counter-part to the masked man, as she bounced and swayed towards him in perfect time. After a couple of songs that followed this format, Nojinza declared to the audience in a commanding yet friendly tone We will go up with the speed. Say yeh. The crowd, by now a group of largely alternative-looking twenty-something’s becoming more uninhibited with each song, responded appropriately and the tempo increased. 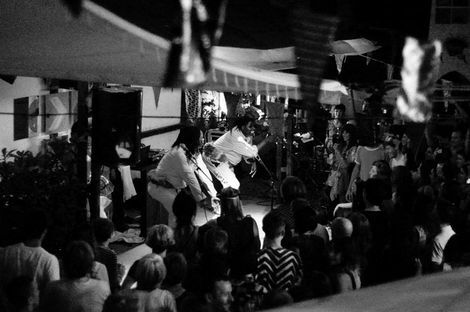 In the African tradition – though now more readily associated with the blues – the songs took on a ‘call and response’feel with Nojinza providing mono-syllabic acknowledgement of the woman’s seemingly interrogative chanting, whilst the jump-suited man continued to move in a manner as anatomically baffling as it was impressive (and as Nojinza himself has said , it’s like he has no bones). It was made clear that almost all of the material performed tonight was in fact unreleased, and when Nozinja played his first track, recorded under Xitsonga Dance, the contrast was clear through sheer ‘rawness’. There was a distinct feeling that the outfit were aware that perhaps the music would have to be somewhat tempered under Warp if it was to reach its full potential on the Western market (though perhaps the disparity could be accounted for by straight-up production capital available and this assumption may be a terrible disservice). A little over half way through the sound-system came alive with Tsekeleke, with Nozinja giving an almost imperceptible nod to the front-line as they noticeably perked up. The set then took an unusual turn with a one-song interlude, featuring a bpm more familiar to hip-hop and a laboured, sensual vocal. The dancing took a short, surely calculated, break, before resuming with renewed force as the tempo crept towards 190bpm. A good proportion of the crowd were by this point utterly surrendered to the relentless cheer, and the demographic had quietly shifted towards a greater diversity of age, colour, and creed. After only an hour the set came to a sudden end with a track that Nozinja himself danced to for the last twenty seconds, followed by a brief introduction of the trio. The inevitable encore comprised of perhaps their best known tune (to pre-Warp fans at least) N’wagezani (my love), and was met with the liveliest dancing from the crowd that night. All in all the night was an undoubted triumph, as Nozinja successfully (and prolifically) forges a pairing that now feels beautifully logical. It doesn’t really develop or go anywhere in terms of a build towards a single atomic drop, or stray too far from a pretty basic beat and melody template, but – and as is so often misunderstood by psy-trance deriders – therein lies its ability to transcend and elevate. Perhaps then ‘Shangaan Electro’ could be more closely likened to this genre than any other modern electronic style – though admittedly only in a visceral rather than technical sense; with its ‘meditative’ appeal, and of course in tempo at the faster end. At a point in the timeline where the only new genres are sub-genres, disregarding a few minor oversights (the beats down way too low in the EQ and a total lack of mixing between tracks), it is clear that Nozinja is striding into uncharted territory with a growing (and dancing) army behind him.